Part Used : Bark, Heartwood, Flowers, Fruits, Seeds. Habitat : Found in north indian plains and in forests of karnataka, kerala, m.p. and rajasthan. Uses : Madhuca fat is satisfactory for production of washing soaps. Seed Oil is used as ointment, in rheumatism and to prevent cracks in the skin in winter. It is used for edible purposes culinary, hair oil, illumination, lighting, keeps body glossy and warm. Madhuca cake can be used as cheap organic manure and possess insecticide property. Also used with shikaki for hair-wash. The flowers are used as vegetable, for making vinegar and . Flower juice is used in the treatment of enlargement of axillary grand, neurotic disorder and taken with cow's milk as an , in cough and bronchitis. Seed paste is applied to curve muscle fatigue and relieve pain in the muscle and joints to improve the texture and vigor of skin. Bark decoction is used in curing bleeding gums and ulcers. Madhuca oil extracted from the seeds has laxative properties. It helps cure piles by relieving chronic constipation. 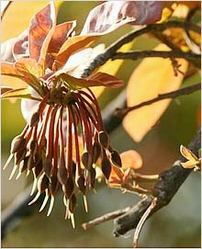 The leaves of Madhuca are effective in the treatment of eczema. Herbs which are not mentioned on website may also be available, please contact us for details.